Indie Next Pick "For Reading Groups"
In 2011, when she was in her late fifties, beloved author and journalist Joyce Maynard met the first true partner she had ever known. Jim wore a rakish hat over a good head of hair; he asked real questions and gave real answers; he loved to see Joyce shine, both in and out of the spotlight; and he didn’t mind the mess she made in the kitchen. He was not the husband Joyce imagined, but he quickly became the partner she had always dreamed of. This is their story. 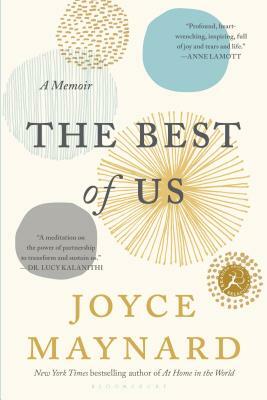 Charting the course through their whirlwind romance, a marriage cut short by tragedy, and Joyce’s return to singleness on new terms, The Best of Us is a heart-wrenching, ultimately life-affirming reflection on coming to understand true love through the experience of great loss. Joyce Maynard was born and raised in New Hampshire. She is the author of several books, including To Die For, Where Love Goes, Domestic Affairs, Baby Talk, and her memoir Looking Back, which she wrote at the age of eighteen. Joyce Maynard has written for many national publications, including The New York Times Magazine, Parenting and Good Housekeeping. She lives in Mill Valley, California, with her three children. “The famed novelist and memoirist on meeting the love of her life, marrying, and facing loss.” —The Philadelphia Tribune, "Fall's Big Books"
“Joyce Maynard shares the heart-wrenching but ultimately hopeful story of finding love only to lose it a short time later in The Best of Us (Bloomsbury).” —Parade, "4 Riveting Reads to Try This Fall"
“[Maynard] delivers a moving tribute to [her husband's] memory and a thoughtful exploration of the connection between love and loss.” —The San Jose Mercury News, "Books by the Bay"